We take the new story on 2018 Mustang EcoBoost and GT for you. Swag and power may already run in Mustang blood, If you wrap your hand around the wheel of Mustang, you feel the power and energy which is stored under the hood. Everybody knows, from the beginning of earth there is always big dog fighting between Ford Mustang and Chevrolet Camaro. So they always trying to refine their technologies and looks day by day. Mustang EcoBoost and Mustang GT are two new weapon launched in this year by Ford Motors. 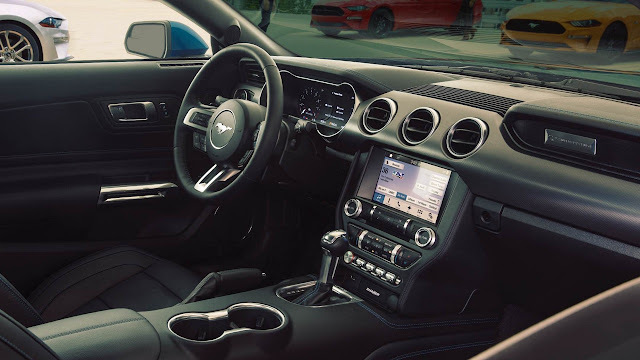 2.3Liter Ecoboost produces 350 lb-ft Torque and Legendary 5.0Liter GT Mustang comes with V8 engine and new dual-fuel, high-pressure direct injection and low-pressure port fuel injection which help to produce 460 Horsepower and 420 lb.-ft. of torque at high rpm which accelerate 0 to 60 mph less the 4 sec. 10 speed gear shift only in Mustang because it’s Ford Patented Technology. Also included are features like electronic line-lock* and launch control* (manual only). Electronic line-lock keeps the front brakes locked while Mustang is in gear to warm up the rear tires. Launch control integrates brakes, traction control and powertrain control to help ensure smooth, consistent starts. 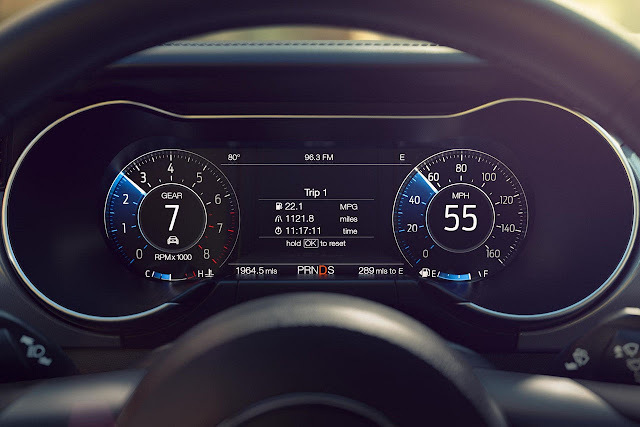 You will also get customizing gauges inside the cockpit, smart-phone access, the 12-inch LCD instrument cluster is the first all-digital display ever offered on a Mustang .Which means you’re in absolute control of everything you see, Customize colors. Let have a look what’s the new in 2018 Mustang. download the FordPass app on the App Store or get it on Google Play. Three new shades introduced in 2018 Mustang , now you a have choice of 11 beautiful colors. The new shades hues are Orange Fury Tri-coat, Kona Blue and Royal Crimsom Tinted Clearcoat. I like the Orange Fury according to me its suite with Mustang energy. With lowered front hood and new fascia frame new LED lighting 2018 Mustang looks awesome its design cues flow into the body lines to the back, where its muscular haunch lets everyone else on the road know what just passed. In GT and GT Premium you’ll get Brembo six-piston front brake calipers with large rotors and TORSEN limited-slip differential. With Dual Exhaust and active valve performance Exhaust you can control the volume of your Mustang’s rumble. From the Inside you can see the Color-accented leather-trimmed seats, Unique color-accented door trim and Linked Graphite aluminum appliqué on the dash which gives it a elite look. If you take Premium plus Package you can also get 12-inch LCD digital Cluster as well as hand stitched center console. The 390-watt Shaker Pro Audio System with HD Radio Technology is optional on EcoBoost Premium and GT Premium models. The audio system includes an AM/FM stereo, single-CD/MP3 player and 12 speakers – one of which is an eight-inch subwoofer smartly mounted in the trunk without sacrificing storage space.The HD Radio Technology, greeting the crystal clear, distortion free sound. A six-month trial subscription is included with your new vehicle purchase so you can listen in the car, at home or on the go with the SiriusXM app. Plus, a five-year subscription to SiriusXM Traffic and Travel Link. Services is included with the available voice-activated Navigation System. These features provide detailed traffic information on accidents, construction and road closures, plus local and national weather forecasts, fuel prices and more. Overall 2018 Ford Mustang EcoBoost and Mustang GT are the perfect combination of technology and beauty. If you want to buy the car in same price range the Chevrolet Camaro ZL1 is another option ,its starting price $25,905 approx . In our new story we will cover Camaro ZL1 .We are trying to provide more information about new 2018 mustang. If you like our blog please appreciate us if you dislike our blog then please encourage us by commenting or if you want to know about any other information about Mustang or any other car ,you can comment in the comment box or our Facebook page “Dwheels.blogspot.com”, or by e-mail on dwheels.blogspot@gmail.com .